Rain showers this evening with overcast skies overnight. Low 48F. Winds NNW at 5 to 10 mph. Chance of rain 40%.. Rain showers this evening with overcast skies overnight. Low 48F. Winds NNW at 5 to 10 mph. Chance of rain 40%. 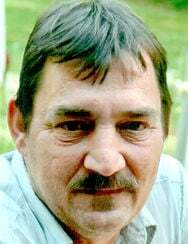 Richard G. Neveau WILLIAMSTOWN — Richard G. "Rick" Neveau, 52, of Williamstown, passed away Sunday, Jan. 27, 2019, at his home. He was born Sept. 19, 1966, in Hardwick, the son of Douglas and Martha (Wheeler) Neveau. He was raised in Cabot and made his home in Williamstown, where he raised his three children alongside Deborah (DuBois) Neveau. Rick was a longtime granite polisher with over 30 years in the industry, most recently working for Art’s Custom Cutting. He enjoyed classic cars, music, action movies and spending time with his friends and family, especially the grandchildren. Survivors include son Michael Neveau, of Williamstown, daughter Natasha Roya and fiancé Nicholas Peck, of West Topsham, daughter, Nicole Ashford and husband Ryan, of Topsham; seven grandchildren; his mother, Martha Neveau, of Williamstown; brothers Daniel Neveau, of Virginia, Rockland Neveau, of Barre, Roland Neveau and wife Suzanne, of Idaho, Kareem Neveau, of Idaho; sister Diane Weber, of Washington; several nieces and nephews. He was predeceased by his father, Douglas Neveau. There will be a celebration of life for Rick at the Moose Club in Williamstown on Tuesday, Feb. 5, 2019, at 2 p.m. There will be no calling hours. The Pruneau-Polli Funeral Home of 58 Summer St., Barre, assisted the family with the arrangements. Those wishing to send online condolences may do so at: www.pruneaupollifuneralhome.com.